Learn how to apply the new principles for evaluation of musculoskeletal permanent impairments using the Guides Sixth Impairment Training Workbook series, developed by the American Medical Association (AMA). 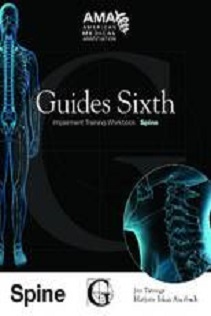 Based on the sixth edition of the Guides to the Evaluation of Permanent Impairment (Guides Sixth), these new, resourceful training workbooks focus on the musculoskeletal systems, including the spine, the lower extremity, the upper extremity, and pain, neurology, and mental disorders. Each workbook contains between 80 and 135 content-based questions with rationales explaining the correct answer. Also included is a 50-question self-test to assess your improved understanding of the Guides Sixth methodology and its application.